Hi Bill, the version Coast play is the long version, presumably the album version. Coast have the song on a computer hard drive, so not sure if I can check on the source. Will check one of my music books. Pat Downey's book on Top 40 songs on CD, says 5:23 (LP) version is on K-Tel 3183 Psychedelic Mind Trip. Plus a 5:09 (LP version faded early) was on Time-Life 2CLR-04 Classic Rock - 1968. Hello Ray, Thanks for the clues, the version I have is from their album Crystal Symphonies The Psychedelic Years, is extended play 5:31 but is modified from the Coasts version which I prefer. 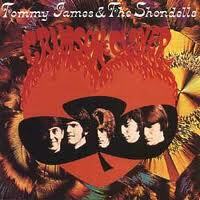 Pat Downey's book says that a 5:30 version was on Rhino 70534 Crimson & Clover/Cellophone Symphony. (LP version with :07 of studio talk) Pat Downey also notes there was available (a noble attempt at recreating the 45 version but unfortunately this is not the real 45 version) for example on Rhino 70630 Billboard's Top Rock & Roll Hits of 1969. Bet you didn't realise things can be so complicated when you're trying to obtain an 'original' version of a song.